08-2017 Director of Dellasposa Fine Art, Jessica McBride explores the history and meaning of artists using the flag motif. For over three decades, British artist and photographer Alexander James has created meticulously crafted sculptural scenes from an array of carefully selected mediums and explored them in relation to the mechanics of water. The result is a body of work in which each piece magnificently fuses the practices of photography, sculpture and painting into single unedited image. Never before in his long career however, has James been inspired to engage so directly and so profoundly in political critique as in his latest artistic project, The Death of the Dream of Democracy. 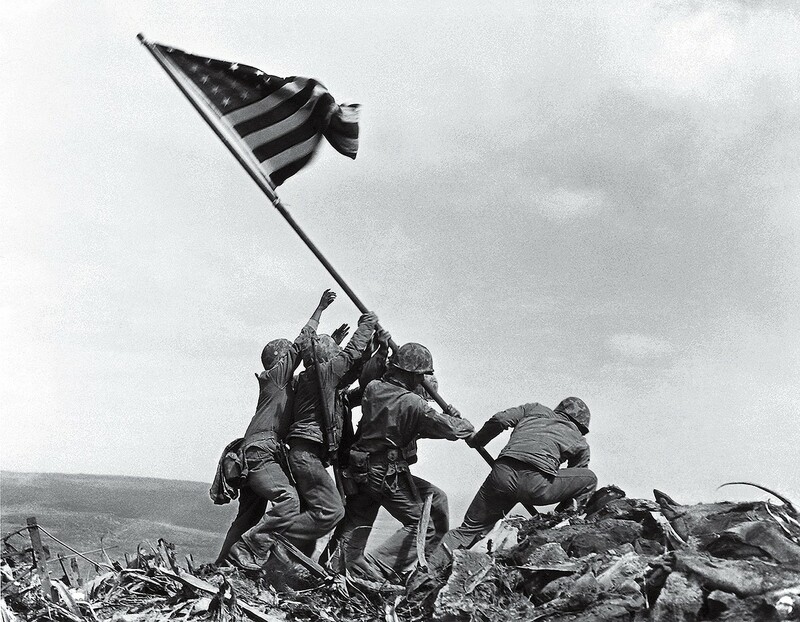 From Joe Rosenthal’s iconic, Raising of the Flag on Iwo Jima to Jasper Johns’ equally renowned Flag of 1955, The Stars and Stripes of the United States have remained an emblem of deep significance to a great number of artists throughout history. Whether used to symbolise the country’s pride or to express its downfalls, the flag has retained an almost unparalleled gravity when captured by the hand of the artist. 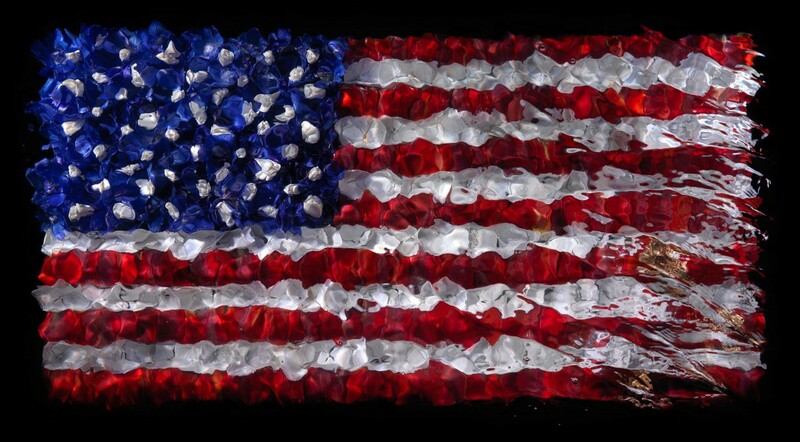 Akin to the butterflies from his Swarm series of 2010, James renders the image of the flag in a manner that is simultaneously beautiful and tragic; beautiful but on the edge of disintegration. Like the delicate wings of the insect, the 2000 individually embroidered flower petals that form the flag’s tapestry are emphasised in their fragility by the weight of the water that James places them beneath and the blackness that he sets them against. This floral allure is undermined by the presence of water that constantly threatens to dissolve the organic matter into nothing. To the eye of the beholder, they seem as if, in an instant a slight ripple could cause them to lose their form and become entirely unrecognisable. Here, the fragility of the American flag stands as a metaphor for the socio-political condition of the country which it represents. For James perceives America under its current presidency to be in a state of instability. Like its constituent parts, its founding ideals of democracy, liberty, opportunity and equality are under threat from the unrest caused by its newly elected leadership. 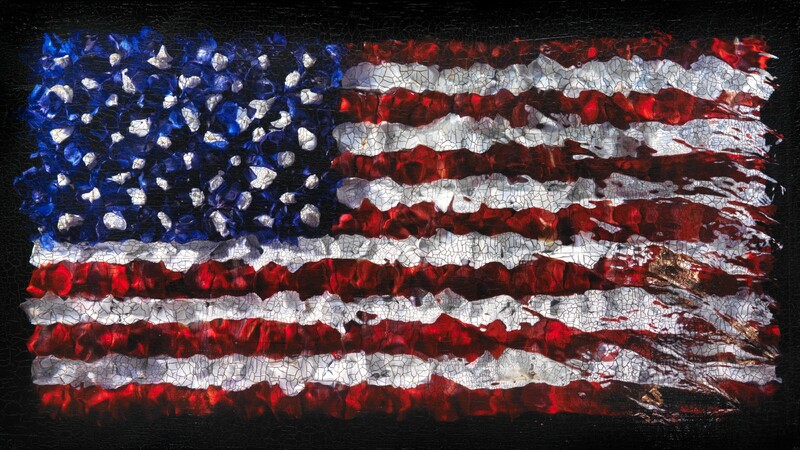 With each disturbance to the water, the bold lines of the American flag become less defined, masterfully captured by James in an effervescent-swirl that marks a period of crucial importance within the history of the United States. The artist’s addition of 24-carat gold leaf floating atop the water’s surface evokes the material excess of capitalism’s greed and excess. Recalling the the long and troubled history of gold in America — from the genocidal Californian Gold Rush of 1849, to the hoarding of gold during the Great Depression, this is a material that has led a great many Americans astray. James’ present concern is once again with president Trump and his publicly voiced belief that ‘he who has the gold makes the rules’. James’ discerning application of gold professes his concern for a leader that places such conviction in material goods and a society in which positions of power are more and more frequently being awarded to the highest bidder. 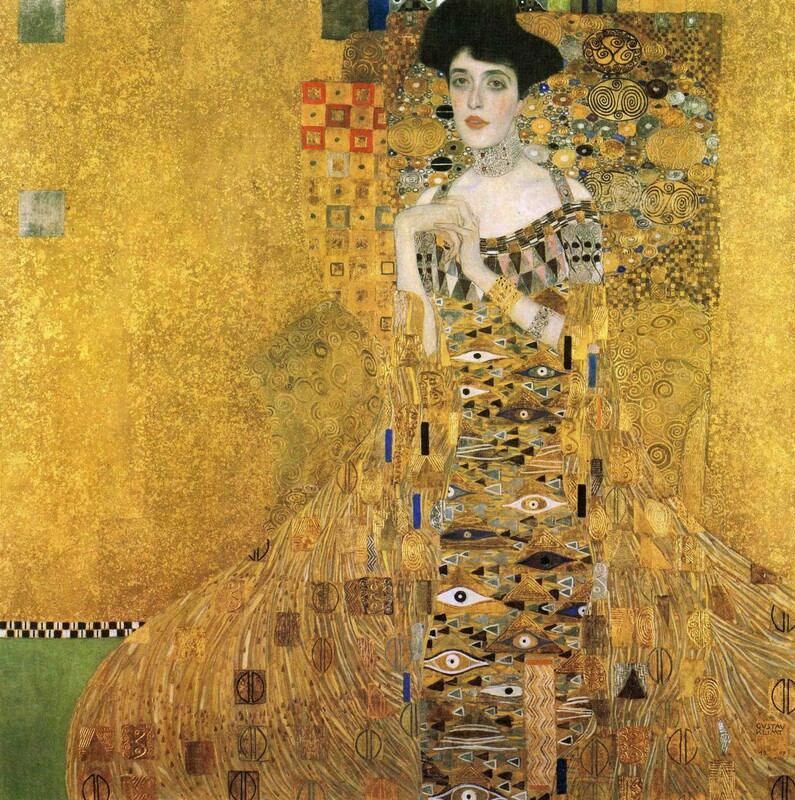 The use of gold follows in the footsteps of art history, drawn from age of Tutankhamen, representing the immense wealth and power of the Pharaoh, the divine light of Renaissance art, to Gustav Klimt’s symphonic Woman in Gold, Jeff Koon’s ‘Michael Jackson and Bubbles’, and Marc Quinn’s golden sphinx, gold has forever been associated with the pursuit of filthy lucre. Like a disease, the gold leaf spreads across the image of the American flag; tarnishing the purity of its values as it does so. It is an ever-growing scar of corruption upon the face of an icon that previously held such prestige. 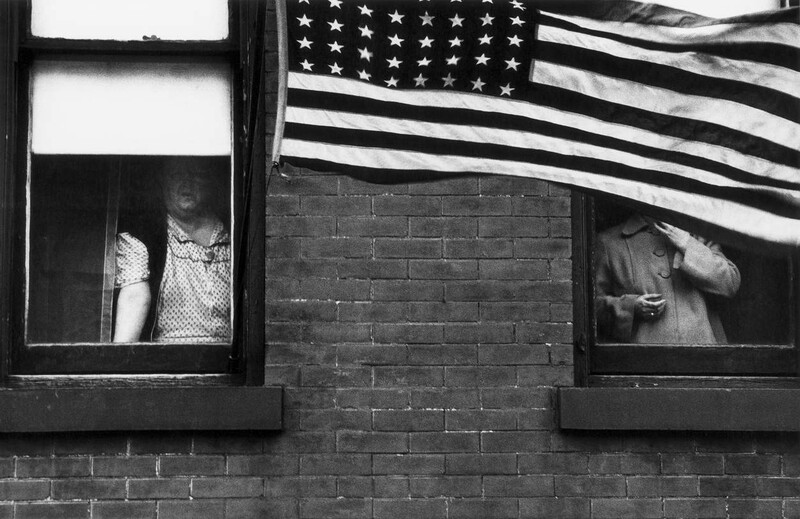 Similarly to the pioneering photojournalistic work of Robert Frank and his seminal publication, The Americans, James’ work captures in photograph the tension between gloss of American consumer culture and the country’s founding political and social values of liberty, opportunity and equality. Just as Frank juxtaposed the icons of American ideals with the grinding reality of city living, The Death of the Dream of Democracy sets in contrast the possibly ulterior ambitions of the country’s leadership, with its original socio-political principles. Whereas Frank used the blur of city to capture its turbulence, James applies the subtler motions of the water to convey a sense of unrest. To draw a further comparison between the work of the two photographers, one could suggest that the petals upon James’ flag are much alike the people captured in Frank’s images; buffeted about by forces they are unable to control, they are simultaneously charming in their appearance, but ultimately tragic in their existence. Frank’s photographic study of American life retains its value today because crucially documented a period of great social and economic change within the country. Without hesitation, it can be said that James’ The Death of The Dream of Democracy is of a similar historical gravity, capturing in a single iconic image, a moment of immense and significant change within the United States of America that will be remembered by generations. Drawing parallels with Jasper John’s Pop Art rendition of the American flag, the present and momentous work by Alexander James calls into question what it truly means to be an American by re-examining its most iconic emblem. The Death of The Dream of Democracy strikingly demonstrates James’s extensive understanding of the implications of his medium and materials. He applies them in a manner that uniquely combines a range of artistic techniques, presenting those of the traditional past in a refreshing and enlightening manner. Truly this work is a statement of its time and is a cause for action to apply artistic brilliance for the betterment of society. Alexander James so elegantly conveys America’s turbulent and changing society in the 21st Century. 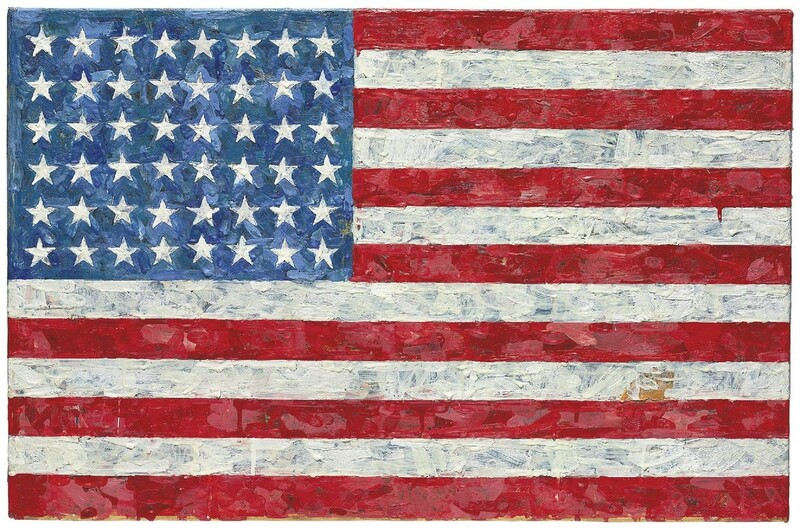 He retains the same quality of observation as that of Robert Frank, the power of iconography used by Jasper Johns, while employing all the while developing his own lexicon and innovative techniques that cause his work to become engaging in the most potent sense. The decision to illuminate the work by backlighting it is a technique used by relatively few contemporary photographers, but provides the work an astonishing museum quality and engages the viewer in a distinctly unique fashion. It is often said of contemporary art that a work is incomplete without its viewer, that the audience becomes a component of the work itself. Here, the radiating glow of light cast upon the viewer as one observes the illuminated flag, causes one to become a literal, physical component of the piece. The effect of the light-box forces the viewer to become involved with the work and the subjects that it confronts. James has found it vital that we as global citizens do not just become a distant spectator to the problems facing America and its democracy, but actively participate in making positive change. The Death of the Dream of Democracy is not only an image of stunning aesthetic beauty, but a visual catalyst in the name of real societal progress. In the present artwork, Alexander James showcases his exceptional understanding of the implications of his medium and materials. The Death of the Dream of Democracy is a true statement of its time and a cause for action in the wake of turbulent times, representing a phenomenal monument to the wonders of democracy and the dream that it could have been. EXHBITION INFORMATION........ The highly anticipated exhibition Death of the Dream, by Alexander James, is curated by Dellasposa Fine Art, in association with Herrick Gallery, London. The exhibition is runs from 4th until 17th September 2017. 93 Piccadilly, Mayfair, London, W1J 7NQ.